The first recorded mention of cheesecake was during the ancient Grecian Olympic games in the occidental world. 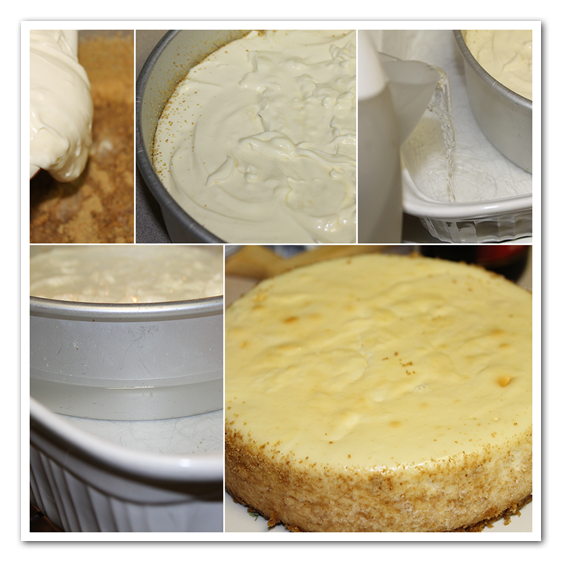 Cato the Elder wrote of cheesecake preparation in his farming manual “De Agri Cultura”. Modern cheesecakes resembles cakes previously used as offerings to gods in greek culture. The delicious desert spread across Europe from Greece like a sweet nectar, pausing briefly at kitchens along the way to bequeath its creamy recipe. Many, many years later (we’re talking centuries, here), the cheesecake made its way to American shores. 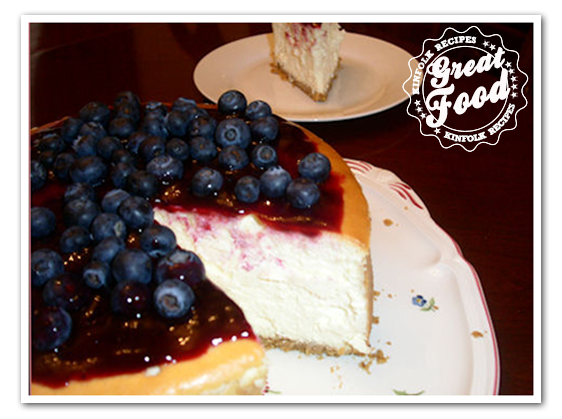 Today, the most prevalent ingredient in cheesecakes is Philadelphia Cream Cheese. As the name implies, Philadelphia Cream Cheese was created in America. Cream Cheese, itself was created long ago, and no one can be sure who its creator might be. Philadelphia Cream Cheese was developed in 1872 by James L Kraft when he was trying to duplicate the French cheese, Neufchatel. In 1880, Philadelphia Cream Cheese was introduced to the market, and cheesecake was suddenly all too easy to bake, and by 1910, cheesecakes were a regular at the desert table. 10 oz jar jelly of your choice. 1. Trace and cut out round of wax paper. Spray the pan with baking spray. Line the bottom of the pan and spray again with baking spray with flour. 2. Grind Graham Crackers in food processor. Press in the Graham cracker crumbs. Sprinkle some on the sides of the cake pan. 3. 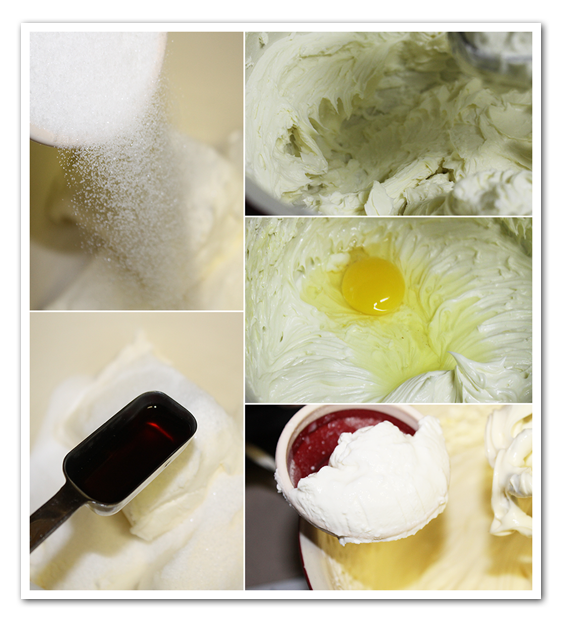 In the mixing bowl cream together, cheese, sugar and vanilla until smooth. Add eggs one a time. Make sure you don’t have no lumps, then add the sour cream. 4. Pour batter in the pan. Put the pan in a casserole dish and add hot water to the casserole dish. Water should be half way to the sides of the pan. Bake a 300F for 2 hours until top is golden and cake is set around edges. It’s okay when the center is jiggly. That will cook while it cools. Remove cake from roaster and set on cooling rack. Run knife around sides to loosen. Refrigerate overnight. 5. 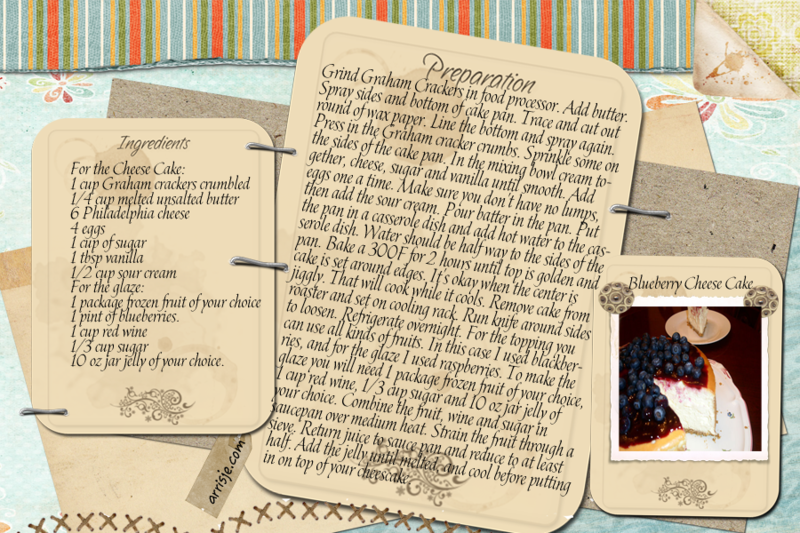 For the topping you can use all kinds of fruits. In this case I used blue berries, and for the glaze I used mixed berries. To make the glaze you will need 1 package frozen fruit of your choice, 1 cup red wine, 1/3 cup sugar and 10 oz jar jelly of your choice. Combine the fruit, wine and sugar in saucepan over medium heat. Strain the fruit through a sieve. Return juice to sauce pan and reduce to at least half. Add the jelly until melted, and cool before putting on top of your cheescake. You can use this for several other different dishes which ask for fruit for instance you can use this with the griesmeel pudding. 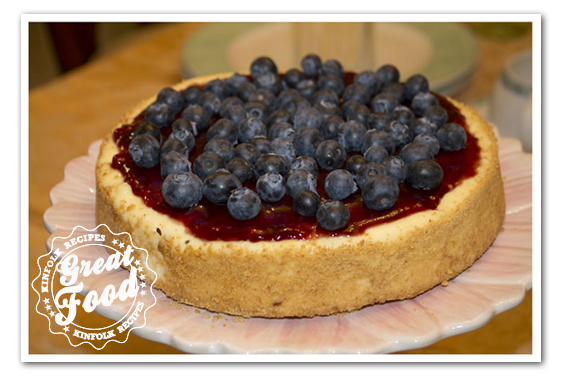 You don’t have to make this New York Cheese cake that high you can make it half the size like the one below ;). Just half the ingredients. 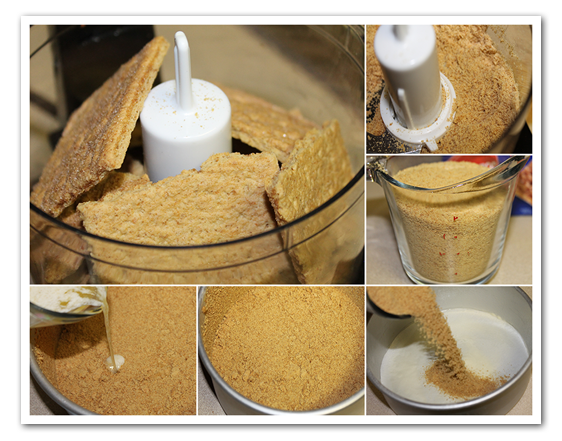 Grind Graham Crackers in food processor. Add butter. 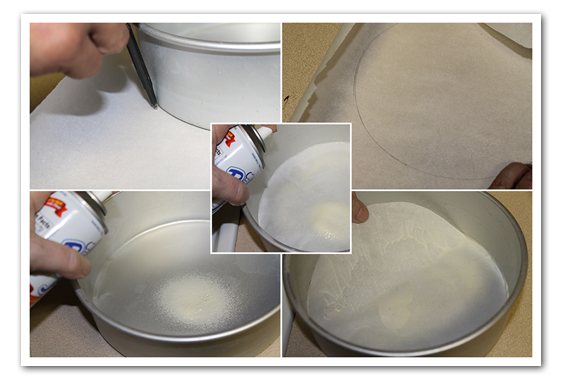 Spray sides and bottom of cake pan. Trace and cut out round of wax paper. Line the bottom and spray again. Press in the Graham cracker crumbs. Sprinkle some on the sides of the cake pan. In the mixing bowl cream together, cheese, sugar and vanilla until smooth. Add eggs one a time. Make sure you don't have no lumps, then add the sour cream. Pour batter in the pan. Put the pan in a casserole dish and add hot water to the casserole dish. Water should be half way to the sides of the pan. Bake a 300F for 2 hours until top is golden and cake is set around edges. It's okay when the center is jiggly. That will cook while it cools. Remove cake from roaster and set on cooling rack. Run knife around sides to loosen. Refrigerate overnight. For the topping you can use all kinds of fruits. In this case I used blackberries, and for the glaze I used raspberries. To make the glaze you will need 1 package frozen fruit of your choice, 1 cup red wine, ⅓ cup sugar and 10 oz jar jelly of your choice. 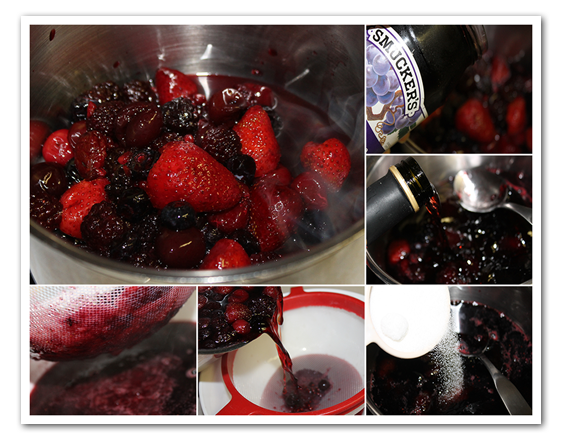 Combine the fruit, wine and sugar in saucepan over medium heat. Strain the fruit through a sieve. Return juice to sauce pan and reduce to at least half. Add the jelly until melted, and cool before putting in on top of your cheescake. You can use this for several other different dishes which ask for fruit for instance you can use this with the griesmeel pudding.